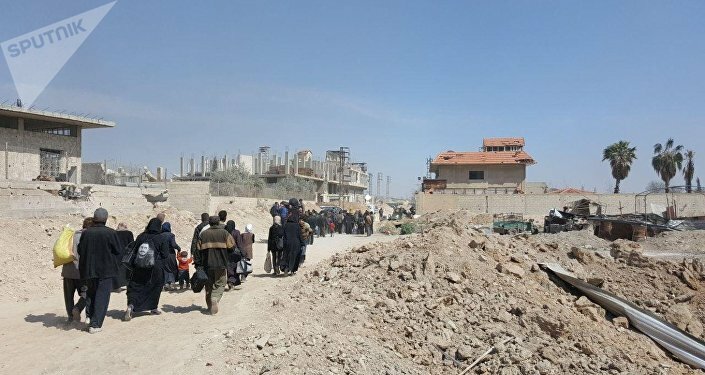 With scores of Syrians still leaving the Damascus suburbs of Eastern Ghouta via humanitarian corridors, the mainstream media continues to issue allegations about the fate of all those who fled the area. Speaking to Sputnik, Eastern Ghouta resident Abdel Rahman Awad has rejected reports by many world and regional media outlets claiming that those civilians who flee Eastern Ghouta are then killed or bombed by the Syrian Army. He underscored that it was the Syrian Army who "saved us after five years of torment." "When we reached the Syrian troops' positions, we made phone calls to our relatives and friends. They were very surprised that we are still alive. It turns out that well-known channels such as Al-Jazeera and al-Arabiya have reported the [Syrian] Army had killed us and buried us in a mass grave, accusing the army and its allies of all possible crimes," Awad said. He said that he and his family are safe and sound, rejecting all other reports as "lies". "All this is done in order to instill fear of the Syrian Army into the souls of all those who live in Eastern Ghouta," Awad pointed out. The interview comes as residents of Eastern Ghouta continue to flee the rebel-held area via humanitarian corridors organized by Moscow and Damascus. In four days, almost 50,000 people have reportedly fled, with 300,000 more still held by the terrorists. The Damascus suburb of Eastern Ghouta has been under the control of armed rebels and the al-Nusra Front* terrorist group since 2012. The Syrian Army launched a military operation to drive the terrorists out of the area in February 2017, and has already liberated 70 percent of the territory.